Roll up, roll up.... It's BLOG CANDY TIME again!!!! It's been quite a while since we had a giveaway and I thought an Old Bag would be a perfect prize. As I mentioned before, we sold out of the fab Old Bags at the Harrogate show, we did say they were LIMITED EDITIONS but, I saved one:) I hid it away for this. It is one of the Game theme collections but there are lots of general bits and bobs in there too. Here are the contents of the Old Game Bag that the winner will receive, it includes a package packed with paper/card pieces (a glassine sheet and pocket envelope, adage tickets, die cuts, tags etc) plus an 8" x 8" Bingo paper (rolled up in the kraft paper). For those with blogs - to enter all you need to do is leave a comment below this post and spread the word on your blog by putting a picture of this blog candy onto your blog sidebar linking it back to this post. If you would like to sign up to become a follower that would be great, as we'd really love you to follow our blog. For those without blogs - please leave a comment below this post. Please note that you will need to leave your full name within the comment to be entered, otherwise anonymous entries cannot be accepted. One entry only, duplicate entries will not be counted. The winner will be selected at random and announced soon after. You will need to call back to see if you have won. If the prize has not been claimed by midday Thursday 4th November, a new winner will be drawn. We would love it if you could spread the word about our Blog Candy Giveaway and our new You Tube channel with a mention in your blog posts. Fabulous candy Jill! The contents look gorgeous so please count me in and off to put this on my side bar. Wow! This is a super cool Giveaway! I have it on my sidebar. Thanks for the chance to win! What a wonderful chance to win and old bag! Oooh what a joy. Missed out on the chance to buy an old bag so great that you have saved one to win, thank you. Have put the prize pic on my sidebar. What a good idea a lot with vintage pieces! I love it! Thank you for the opportunity to participate! It took the link to my blog! Oh how fabulous, I missed out at Harrogate as we didn't go til the Sunday and they'd all gone by then - lol. Thanks for another opportunity to get hold of one. After visiting your fab shop on Saturday I'd love to win some blog candy. What fantastic candy!!! I have put a pic on my sidebar with link. 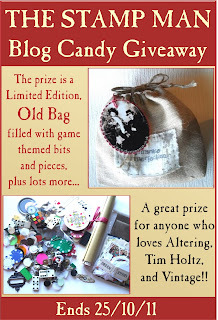 Thanks for the chance to win this fabulous blog candy, I've put it on my sidebar. I'm already a follower and have just added the photo and link to my sidebar too. Hope I'm not too late to join in the fun!! I just love surprises especially this kind !! your wonderful giveaway is on my sidebar. thanks for the chance to win! Fab candy would looooove to get my hands on one of the old bags! Thanks for the chance to win those goodies! :) Of course, I put a link to your giveaway on the sidebar of my blog. oooohhhhh, how wonderful is this bag of stuff? I wish i would have saved these pieces! Please pick me!!! Fabulous giveaway - would love a chance to win. I have posted a link in my side bar. Thanks all. Such a fun giveaway and I would be doing the happy dance if I won this amazing blog candy! Have added this to my sidebar! 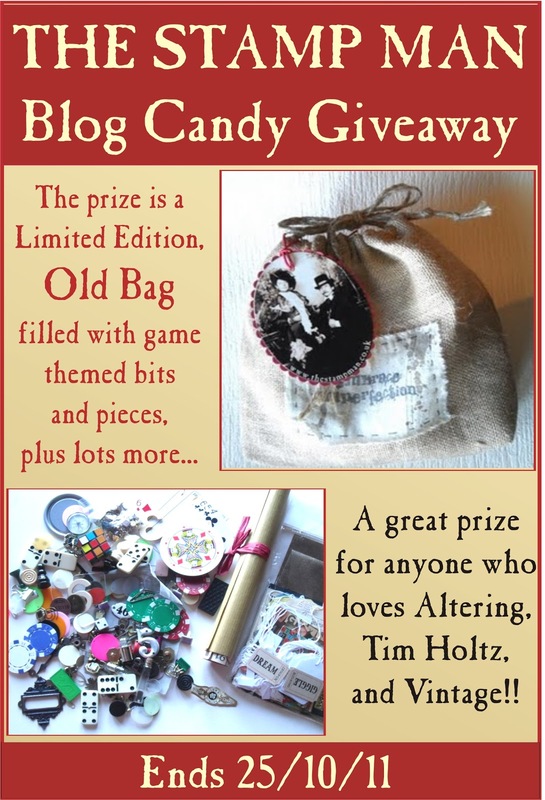 this is a great giveaway i would love the chance to win some very delightful candy ...your is defo in my blog !! Who wouldn't love to win a beautiful bag with great goodies? I advertised your candy on my blog. Thanks for giving us the chance to win! Totally yummy candy. I am already a follower and have put a piccie on my sidebar. Thanks for the chance. Wow what a fabulous Candy Treat!!! Thanks for the chance to win - I already follow your blog and have put a link in my sidebar for you. Wowwwwwww, great challenge!! Thank you so much for the change to win. I'd love to be the one who puts up a blog post of how I won the old bag of craft bits. Oh dear! does that mean I have to give something away too? Thanks for the chance to win this scrummy candy.Fingers crossed as would go fab with my new configuration boxes awaiting to be played with.Have added your logo and linked up to my candy jar on rt hand side of blog. Thanks for the chance to win! Very generous! I like your blog. Of course, I put a link to your giveaway on the sidebar of my blog. OMG - I thought I'd joined in with this already - DOH!! Off to do the link inmy sidebar right now!! What a generous giveaway. I'd love to win an old bag. 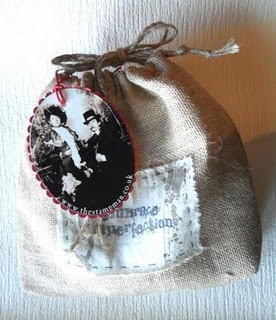 Posted your button on my blog at onceuponafirefly.blogspot.com.